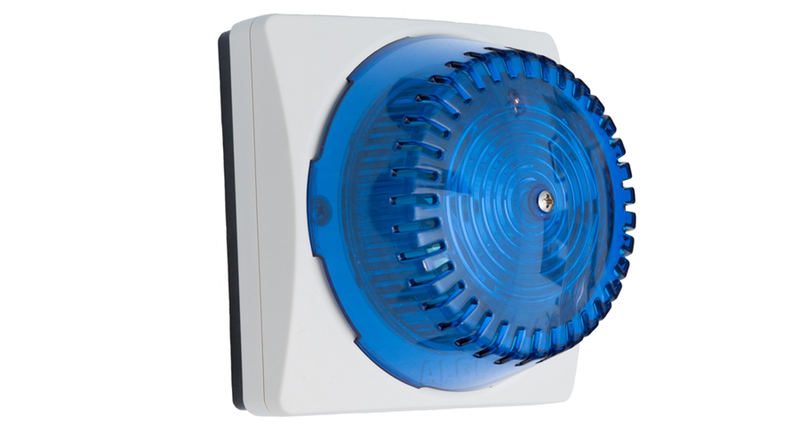 The 1128B Analog LED Strobe Light is a high intensity strobe light for alerting and notification of telephone, emergency, safety, and security events. The 1128 Strobe flash intensity can be chosen to suit the application and environment. There are non-flashing patterns for passive, gentle notification, and aggressive patterns for maximum conspicuity in busy environments. The 1128 Strobe is typically wall or ceiling mounted. The eight efficient and powerful LEDs cast light 360 x 180 degrees with some light illuminating the surface surrounding the 1128 Strobe for additional visibility. Light output is equally intense in every direction unless a directional pattern is chosen. The 8128B comes with the optional blue lens cover.